The Samsung Galaxy Tab S5e is a new premium tablet that offers up-to-date hardware, recent software, and a lot of interesting features. We get a very slim body, four speakers, a Super AMOLED screen, and a Snapdragon 670 octa-core processor. It is one of the first tablets to ship with Android 9 Pie. Here is everything you should know about the Samsung Galaxy Tab S5e. The Samsung Galaxy Tab S5e is one of the very few tablets from Samsung that actually does feature a full metal body. Even though we get an aluminum chassis, it is just 5.5mm thin. With that, it is the thinnest tablet currently available. It weighs 400g and you can get it in black, gold, and silver. Even though the Galaxy Tab S5e has four AKG speakers on its sides, a standard headphone jack is missing. Instead, we get a USB C port and a slot for microSD cards. That one can hold cards with a capacity of up to 512GB. We get two cameras with a resolution of 8 and 13 megapixels. I also like that there is a fingerprint scanner built into the power button. The display has a diagonal of 10.5 inches and an aspect ratio of 16:10. It is a Super AMOLED screen with a high resolution of 2560 x 1600 pixels. No, you can not use it with an active S Pen stylus. However, using a PIN connector, you can connect an optional keyboard dock. Inside the Samsung Galaxy Tab S5e runs an upper-middle-class SoC. That’s the Qualcomm Snapdragon 670 which is an octa-core chip with two 2GHz cores and six 1.7GHz cores. It is supported by 4GB of RAM and 64GB of internal storage. If you want, you can also get it with 128GB and optional LTE 4G. Yes, it is one of the first tablets to ship with Android 9.0 Pie. On top sits the own interface from Samsung which looks similar to their smartphones and customizes the UI a lot. We also get the voice assistant Bixby, as well as a kids mode. Samsung announced the Galaxy Tab S5e on February 15th 2019. It got released in Europa and a couple of other countries starting on April 5th. While it’s not available from the start worldwide, it should be released almost worldwide soon. That includes countries like the United States, India, Taiwan, Thailand, the Philippines, and Indonesia. Prices start at around 400 US Dollars, depending on the region. An interesting alternative to the Samsung Galaxy Tab S5e is the Samsung Galaxy Tab S4. While the display and internal hardware are similar, the Tab S4 features an S Pen. So, if you like to use an active stylus, that one is a nice alternative. You should also check out the Huawei MediaPad M5 10. With that one, we get powerful hardware and a metal body too, as well as four speakers and a high-resolution screen. However, it’s a standard IPS display and not an AMOLED screen. If you like iOS too, you should also check out the Apple iPad Air 2019. While it is a bit pricier, it is much faster and supports the Apple Pencil. However, you have to live with two speakers only. 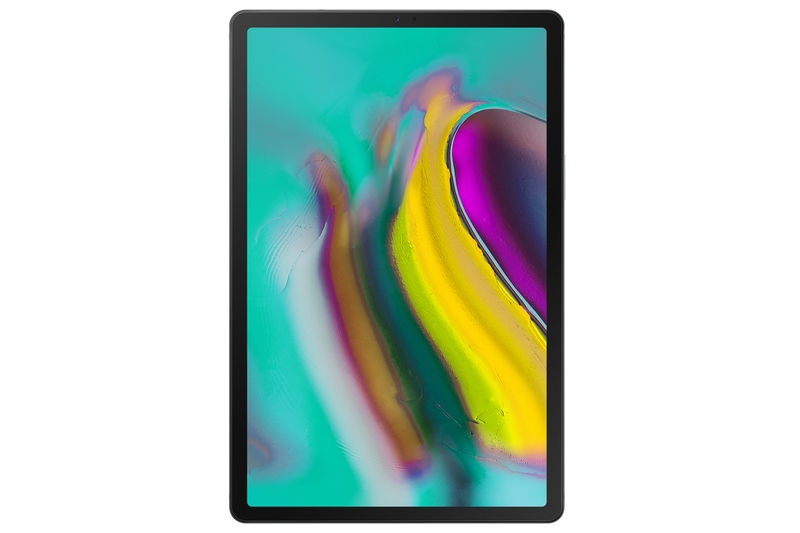 The Samsung Galaxy Tab S5e is a 10.5-inch Android tablet featuring a Super AMOLED screen, a Qualcomm Snapdragon 670 octa-core processor, and a fingerprint scanner. It has a full metal body, four speakers, and is one of the first to ship with Android 9 Pie.